It’s not as easy as it looks. 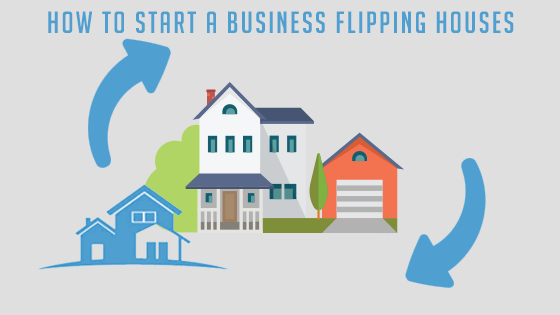 Find out How to Start a Business Flipping Houses in this following article. People make money flipping houses every day, but the secrets to success start with really knowing what you’re doing. And finding a good house to flip is much harder now because the market is so strong for bargain-priced homes. Nobody is going to hand you a house for free. If you are new to the real estate business you will have many questions, ranging from funding to finding deals and everything in between. There are many different ways to approach your new real estate business but if you surround yourself with successful folks, have a positive attitude, a well thought out business plan, a good source of leads and a strong work ethic you will have great success with your new real estate business. The best real estate guidance I can give for your new business is to make sure you have systems in place before you start investing your own money. As an investor you must always have a plan of action, a specific purpose, easily defined goals and last but certainly not least a mentor/s. If you are committed to your success you will most definitely need those components above and a large network of investors you can bounce ideas off of and ultimately learn from. Remember, that in real estate you have peaks and valleys, do not get too high or too low and do all you can to stay positive. To all the beginner investors, one of the best real estate investing tips I can give to you is to start off in this business by wholesaling properties; wholesaling investing allows you to learn the business without risking your own funds, in my opinion this is how all investors should start their careers as it allows you to learn the many facets of real estate investing without having the risk. If you are serious about creating a strong real estate business than you need to come up with a business plan and know what type of properties you want to focus on. Make sure you know your market so you can determine the best areas to buy properties and so you can focus your efforts and energy there. Be sure to network with investors, after all this is a relationship business,spend at least an hour reading about investing as you never want to stop learning. In addition to these above, you will want to find a good realtor to help you find properties – make sure they understand Return On Investment, Net Operating Income and debt service, you will also need a good real estate attorney as you will be closing on a lot of properties and you’ll need someone that you can trust and that will protect you and finally you will need a strong lending source, realtors and attorneys may be able to give you some recommendations but I would recommend asking other investors, lending options will include banks, hard money, private money, mortgage lenders, portfolio lenders etc. Investors will have many real estate investing tips for you, my advice is to listen and when they are done talking, ask them for more advice. Remember, this business is all about relationships and while networking is not always the most enjoyable activity it is necessary and will help you find success sooner rather than later. In order to have success in real estate you need to have systems to follow, a team of experts, a positive mindset, a strong desire to succeed and a great source of leads. If you are the smartest person in the room itwont make a difference if you don’t have quality leads. You could be the best salesman in your town but if you don’t have the leads, none of that will matter. You can access leads in a variety of ways, below is a list of ways to generate more real estate leads for your business. Ways to find leads- Direct mailings, Cash buyer and motivated seller ads on craigslist, Networking with other investors/investing groups, Build a website for your business, Run a SEO campaign to attract motivated sellers and cash buyers, Always ask folks if they know of any great deals, Google probate attorneys in your town and network with them, Hubzu.com, Auction.com, Xome.com, HUDhomestore.com, Ask banks for their REO list, Find a foreclosure list provider, Find list of for sale by owner homes, Join your local REIA group, Visit your courthouse’s clerk office and look through list of foreclosed homes, Build a Facebook page for your business and post weekly, Post bandit signs, Conduct skip traces for mailing that is returned, Set up an automated phone system for motivated sellers, Drive through neighborhoods and look for vacant homes. If you are serious in making money, make sure you have a lead generation plan because without one you will not have the success you deserve. If you want to experience success make the investment and find a lead generation system that works for you. Another major key to success as a flipper is accurately estimating both cost and timeline. That doesn’t mean there won’t be surprises, but you want to calculate the true cost of getting the property ready for sale. That includes purchase price, repair costs, marketing expenses and carrying costs, such as mortgage insurance and utility payments. When you buy a home, you don’t always know what’s behind the walls: mold, asbestos, water damage, antiquated electrical lines, foundation issues or crumbling plumbing pipes. But, if you understand construction, you can make a more accurate estimate. When you get into these problems and don’t know what you’re doing, these problems can swallow your profit and put you under very quickly. In addition to those mentioned above, below are more tips of how to become a successful house flipper. buy in the right neighborhoods – know where properties sell fast and where they do not. don’t overimprove – never out price yourself for market you bought into. add special touches that don’t cost much – know how to make improvements that catch the customers eye that doesn’t cost you an arm and a leg. sell quickly – don’t be a pig. Price the home to sell and to sell quickly. Don’t waste time on market. Flipping properties can be difficult and complicated at times especially if you are trying to learn on the fly and don’t surround yourself with a great team. My advice to you is network, learn from others and when you surround yourself with the right people go ahead and buy that first flip. If you surround yourself with the right people, have a positive mindset, a strong desire for success and a plan of action than you will have no choice but to be successful. Have confidence in yourself and don’t be afraid to take risks but make sure they are calculated ones and are not done just on a whim.